TV coverage of Ulster Rugby's matches is set to change. This move will bring further new audiences to the game and support our development of the sport at grassroots level - that was the assessment of Ulster's CEO Shane Logan when, in 2010, it was announced that what was then the Magners League would be brought to free-to-air TV. The deal, which followed on from a pact with Setanta, would see Ulster's games in Ireland shown on BBC2, with the remainder to be aired on red button services as long as they were covered by partners in the relevant countries. 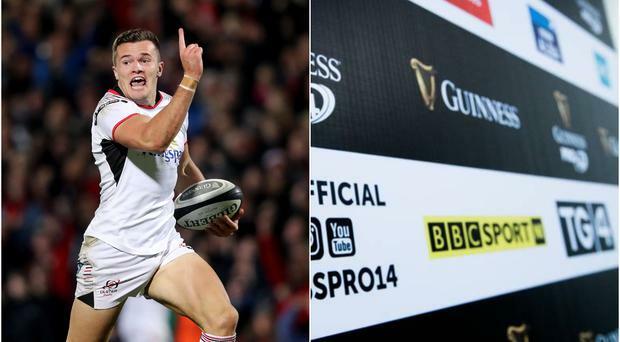 It soon morphed into the deal we know today, where to date every one of Ulster's games this season has been aired on the Beeb, even when also shown on Sky Sports. Cash is king now though, even when that means fewer eyeballs, and it will be all change next year with Guinness PRO14 broadcast rights set to go to Premier Sports, owned by the Luxembourg-registered Premier Media. While the company also own FreeSports, a channel currently free to 20 million homes in the UK, it seems that two separate subscriptions will be needed to see every match broadcast next year, and it is hard to envisage some games not slipping through the cracks. Those "new audiences" spoken of by Logan just eight years ago now won't find most Ulster games unless they happen across, and have access to, a channel which requires an additional £9.99 per month. That's a real shame for a game here that goes from commercial strength to commercial strength. Competing with football and Gaelic games, as well as the major sports in this province, the blossoming of Ulster into an organisation averaging more than 14,000 through the gate for each home game is one area the under-fire organisation can rightly boast of their achievements. Attendances have been down of late, and of course there is an argument that without the option to watch from the comfort of the sofa numbers may trend upwards again, but there is a lot to be said for ease of access when it comes to winning new fans. Former Ulster player Stephen Ferris watches from the BBC NI commentator's box. When a youngster happens across the likes of Jacob Stockdale on TV, a desire to see him in the flesh becomes a natural next step, and sports like cricket, Formula One and boxing have all shown the fine balance that must be struck between more money up front and continued exposure. There can be no doubt that, while success is the ultimate driver of interest, the BBC have been good for Ulster Rugby. A weekly two-hour showcase of your product on prime-time TV available to every house in the UK? And they're paying you? For many, commentator Jim Neilly is the voice of Ulster Rugby, his distinctive tones filling Friday evenings from September through May. Local pundits such as Stephen Ferris, too, have proven adept in transitioning from making headlines to discussing them in a manner that strikes a chord with their partisan viewers. By all accounts, the BBC seriously upped the ante when it came to their efforts to keep a hold of the rights but it was not to be enough as the league continue to search for ways to bridge the gap between the big-money TV deals enjoyed by teams in England and France. Prior to this season, the 12 sides that comprised the cross-border competition shared TV money that brought in a little under £1m per team. Two South African sides, Cheetahs and Southern Kings, delivered an additional £6m to be shared but the numbers still pale in comparison to the £42m for the Aviva Premiership, itself virtually half the figure for the Top14. BBC Sports presenter Gavin Andrews (left) with Ulster's Darren Cave. TV deals have never been richer, nor has it ever cost more to support your side. While Ulster have frozen season ticket prices for next season, that comes with the caveat that there could be one fewer home game in what may also be a campaign with no Champions Cup rugby. The need to open the wallets once again will be yet another thing sure to rankle with fans in a season that has already provided a number of hammer blows. With such negotiations the purview of league bosses rather than the teams themselves, this is one occasion when the finger of blame cannot be pointed in the direction of BT6 and the key point in all of this will be just how much more Premier Sports have been willing to pay and where it will go. Increased money for the likes of Ulster in the short-term is certain, but at what actual cost? The province and the PRO14 may well just have to hope it's not quickly a case of out of sight, out of mind.